Blue Jackets' Centre RJ Umberger is apparently not impressed with the Washington Capitals. TSN.ca is reporting that Umberger recently told the Columbus Post Dispatch he was not too impressed with their style of play. "I don't think any team in the West would be overmatched by them," Umberger told the Dispatch. "They play the wrong way. They want to be moving all the time. They float around in their zone, looking for breakaways and odd-man rushes. "A good defensive team is going to beat them (in the playoffs). If you eliminate your turnovers and keep them off the power play, they're going to get frustrated because they're in their zone a lot." While the Capitals play an interesting blend of hockey, it will be interesting to see how they perform in the post season. 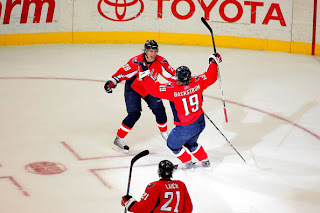 Many followers of the NHL believe the Capitals may be in tough against the best of the Western Conference, the Capitals appear poised to run deep into the playoffs due in part to the lack of elite competition in the Eastern Conference. As of today, the second place New Jersey Devils would barely be hanging onto 6th place in the Western Conference, and that's with playing lesser competition in the East for the majority of their games. Whether Umberger's comments draws the ire of the Capitals and their fans remains to be seen, but Washington may suggest that Umberger remain more concerned with the style of play of his own team, who sit near the bottom of the Western Conference.